Amazing! 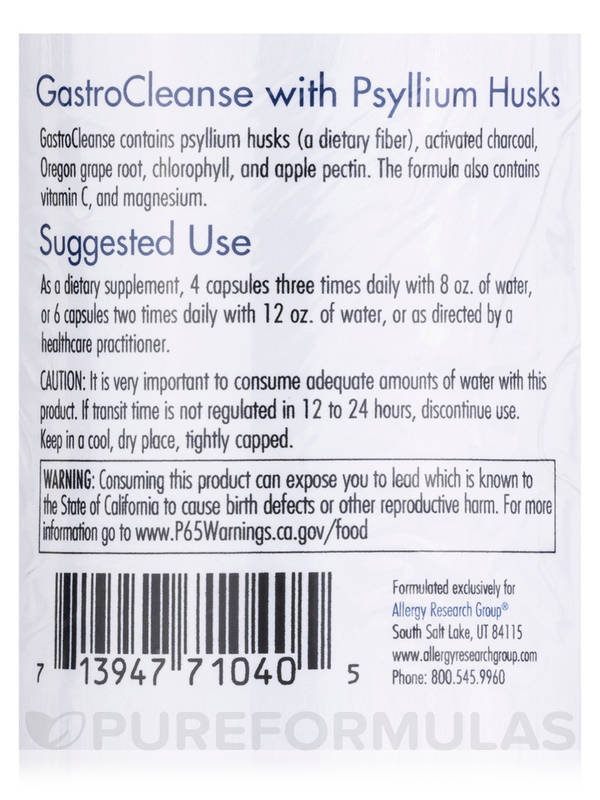 I've been using GastroCleanse with Psyllium by Allergy Research Group for about six years if I deviated from my diet or tried something my body didn't like gastrocleanse really got me thru! Cleaning out your gastrointestinal (GI) tract is extremely important and should be done regularly‚ since your digestive system works hard to filter out many different types of bad bacteria and toxins that find their way into your body. However‚ a common mistake is treating your body like you would your garage‚ shed‚ or den: you pile everything into it and never get around to cleaning it out thoroughly. This is a dangerous routine to follow‚ since many health problems and discomforts may result from an unhealthy GI tract. Some people realize they may need to cleanse their digestive system when they become constipated‚ which is quite common. Over-the-counter laxatives may help relieve constipation; however‚ these medications may cause dehydration. Increasing your fiber intake is a safe‚ natural‚ and easy way to relieve constipation. Fiber helps bulk up your stools‚ making them pass through the colon easier; this allows for more effective elimination. Meanwhile‚ cleansing or fasting may remove toxins from your gastrointestinal system. 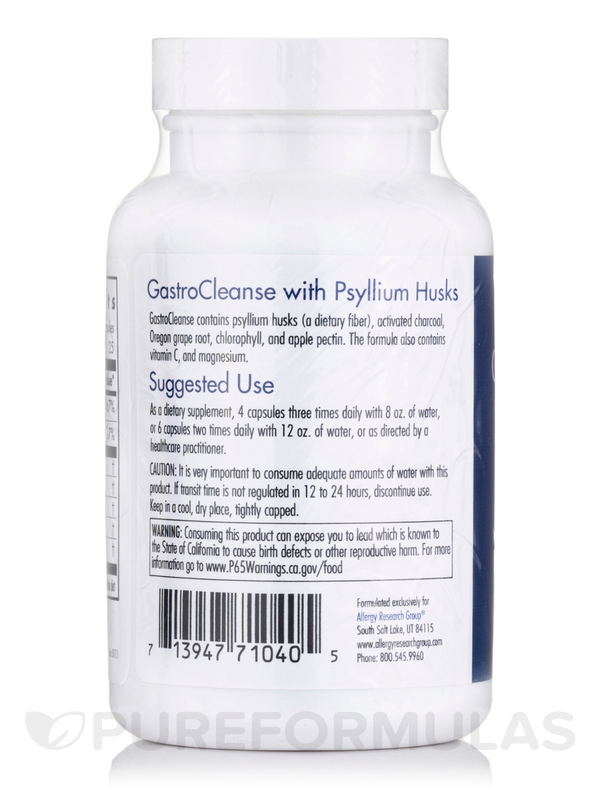 GastroCleanse with Psyllium by Allergy Research Group is a fiber supplement that may clean out the GI tract and allow stool to flow through the colon more efficiently. Psyllium husk—a good source of fiber. 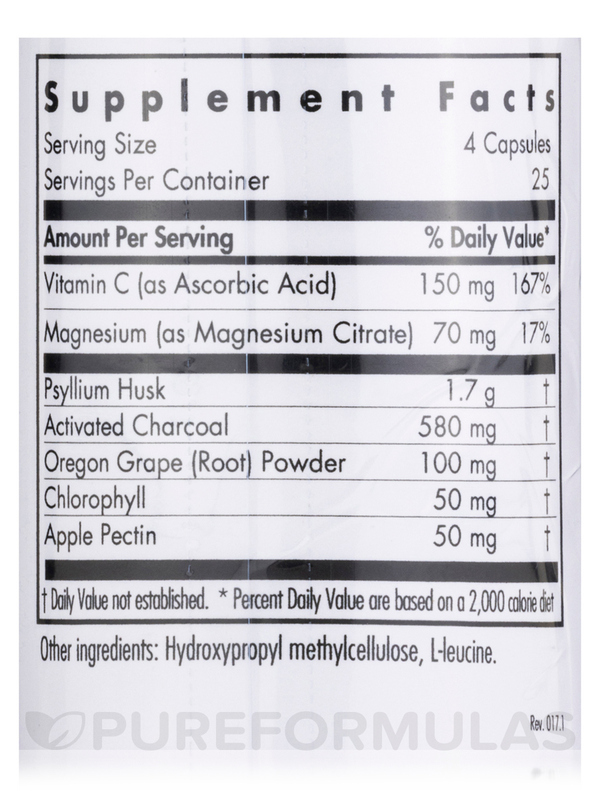 Activated charcoal—used for absorption purposes. Goldenseal root extract—contains properties that make it an antibacterial‚ anti-inflammatory‚ and mild laxative. 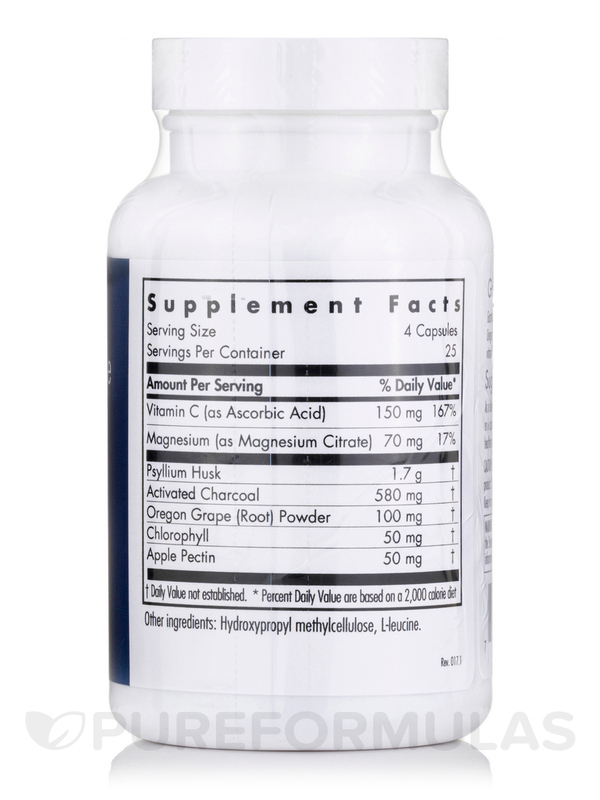 Chlorophyll—promotes absorption and may support the metabolism process. Apple pectin—derived from fruits and high in fiber; it may treat digestive issues‚ reduce inflammation‚ and promote regular bowel movements. Lactobacillus acidophilus—a probiotic (good bacteria) located in your digestive system that helps it function properly and lessens inflammation. The recommended dosage of Allergy Research Group’s GastroCleanse with Psyllium is four capsules three times daily‚ with a glass of water. One 100-capsule bottle will last for about eight days. Suggested Use: As a dietary supplement‚ 4 capsules three times daily with 8 oz. of water‚ or 6 capsules two times daily with 12 oz. of water‚ or as directed by a healthcare practitioner. It is very important to consume adequate amounts of water with this product. If transit time is not regulated in 12 to 24 hours‚ discontinue use. Keep in a cool‚ dry place‚ tightly capped. It works! And its price, I'm on a fixed income so the price is right for something I depend on so much! Can't beat the all in one clean up. 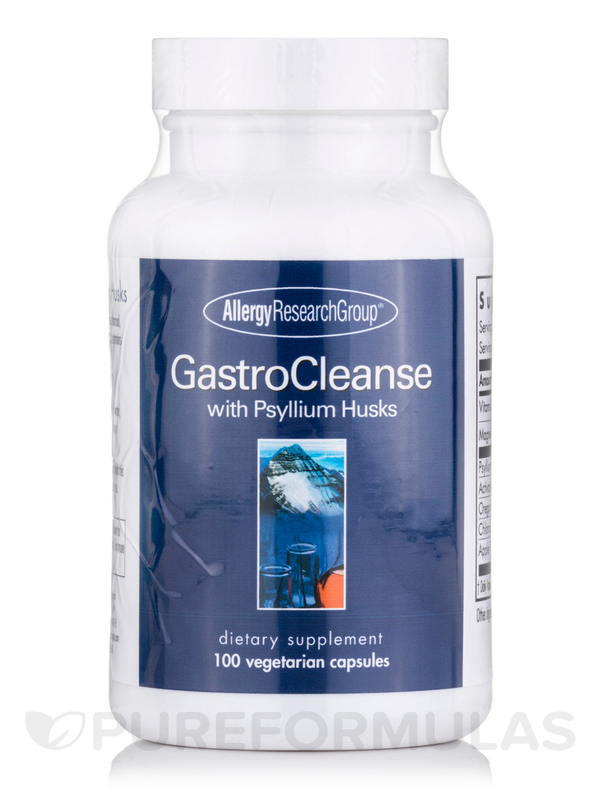 GastroCleanse with Psyllium by Allergy Research Group is the only product I've found that has all essential clean up tools for toxins in one place.